seeking out, tasting, creating, and sharing delicious food. occasional tangents into music, movies, and other wholly relevant topics. Vegetarian Restaurants: Don't get me started. 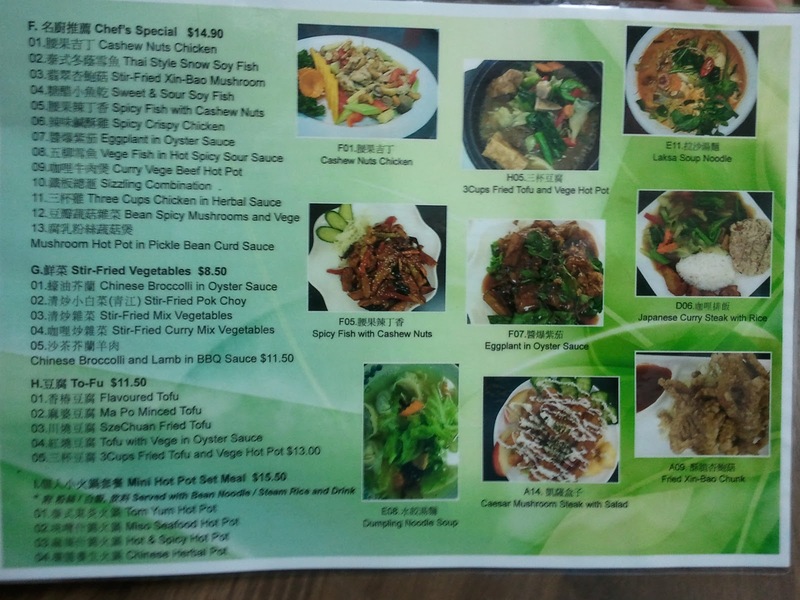 Why is it that, with a few exceptions in Brisbane (Loving Hut, and The Green Edge), non-vegan restaurants serve us much better food than any of their vegetarian restaurant counterparts? Is this the same everywhere? WHY?! Well, I could go on and on about the level of nobility required to open a vegetarian restaurant for the sole purpose that you want to promote vegetarianism, and provide an option - but we all know that's only going to last so long. As The Academic says, People need to open restaurants because they have a passion for food, and THEY CAN ACTUALLY COOK! What an epiphany, to some. Still, I appreciate anyone who has the chutzpah to open a restaurant in this current economic climate, let alone a vegetarian one (have you noticed that people love vegetarian food, but only when it's not termed as such? Go figure). Long ago, Brisbane had a restaurant called Huo Fo. Damn, it was good. I can't tell you how delicious the food was. And slowly, sadly, they made renovations to the charmingly offbeat outside dining area, changing it from the outdoor, perma-Christmas-decorated, woodsy BBQ style venue it was, to a homogenised venue of big fluoro lights, fans, and a white roof canopy, as the prices crept up, and the patrons stopped coming. Next thing we knew - they had closed, promising to re-open sometime soon. World travels fast in the veg*n world, and, a year or so from the time of original closing, sure enough - I heard there was a new vegetarian restaurant on the Southside, called "Su Life". And the rumours flying around were that it was the restaurant formerly known as Huo Fo! We ventured in, and I recognised the staff immediately - or should I say they recognised me! Even the sweet owner - who doesn't seem to speak a lot of English, but always makes an effort to greet and welcome us. She is so friendly, and charming - I suppose restaurauteurs have a gift for the gab. 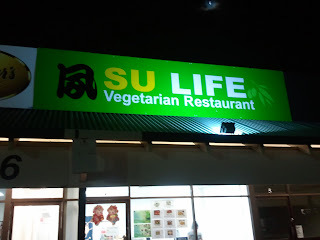 Anyway, Su Life and Loving Hut are the best vegetarian/vegan restaurants in Brisbane, depending on what you feel like, despite their lack of... decor.. If it's Cafe-style food you're after, check out The Green Edge (note: Burgers are available Wednesday, through to Sunday. Needing to visit on Monday? Have a pie and a chocolate sundae instead). Su Life has much more of an austere feel in decor, compared to Loving Hut's clinical sunniness - it is almost a hole-in-a-wall, but we all know that the best food is often at the places you least suspect! And the prices are very reasonable. Golden Pancake I think this is a variation on the traditional "cong you bing". I can't describe how delicious this is. Layers of flaky, rich, savoury pastry - sprinkled with the perfect mix of asian spices, and some homemade mayonnaise. Spicy Crispy Chicken The ultimate in food. The best item on the menu. Arguably the best vegan main meal in Brisbane. I've *never* had someone say they didn't really like, or love this dish. Never. No matter what their individual tastes. This is the all-purpose all-love-meal. Imagine: delicious, perfect little chunky-thin nuggets of chicken-style protein, chewy and fatty, quick-fried, covered in salt, and smothered in a spicy, sweet, umami sauce. 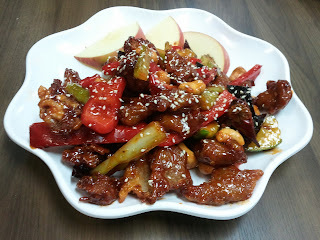 With cashews, chillies, celery, sesame seeds and capsicum. I can't tell you how good this dish is. Everyone needs to try it once in their lives. Deep-fried squid Pretty self-explanatory, really. Great texture, great seasoning. Radish cake (on the far right) Termed something else on the menu. Creamy, smooth, comforting, like multi-flavoured, thicker, fried mashed potato. Eggplant and oyster sauce I'm always hesitant to order eggplant dishes - despite my love of eggplant, as a general rule, they'll be swimming in oil. This wasn't - the garlic, the ginger, and the basic flavours were clean, left clear and able to sing. The Asian greens and coriander contrasted beautifully with the tangy flavours, and the eggplant was cooked to perfection - melt in your mouth, but crisp on the outside. 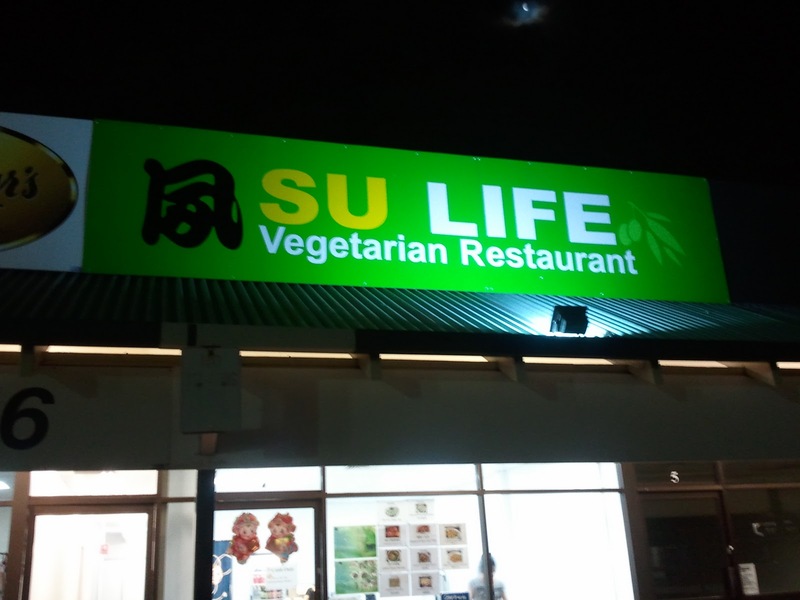 Su Life is located at Shop 4/2120 Logan Road, Upper Mount Gravatt, on the left hand side of the Palmdale Shopping Centre (opposite Garden City Shopping Centre). It is open every day except for Monday, for dinner, and my understanding is that it is open 11:00-2:30pm for lunch, again, except Monday. Do call and confirm first. And I've been advised that their phone number is (07) 3349 5995. Take me with you when you go. Hot tip: Don't order the combo meals that come with rice. Stick to the entrees and chef's specials. Finally, another fantastic vegetarian restaurant in Brisbane! Welcome back, Su Life! 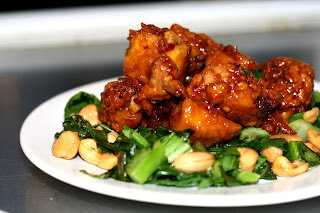 By the way, if you're the creative type - my friend Arly tried the spicy crispy chicken mentioned above, and was so impressed with it that she immediately went home and set about recreating a home-cooked version of this dish.... So if you'd like to attempt to make this deliciousness yourself with tofu, you can! View her recipe by clicking here. I find that non-veg restaurants can go two ways — they either excel at creating gourmet vegan meals, or they throw something half-baked together and call it vegan. (Like a few grains of rice and some mushrooms.) 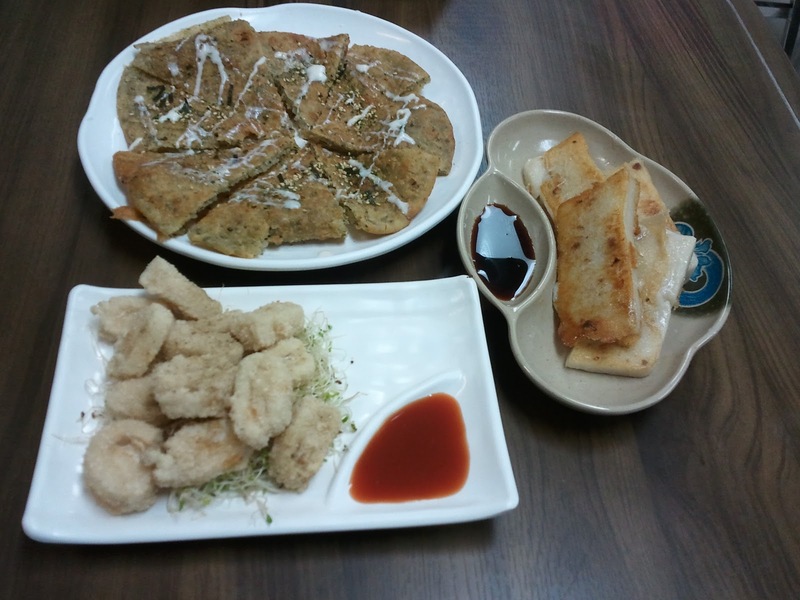 Huo Fo sounds just like a similar restaurant here, except they have radish cakes. I LOVE radish cakes, and hardly any restaurants serve them. We used to be regulars at Huo Fo when it first opened, at least once a week we were there... but then like you said, the prices just kept creeping ever higher and before we knew it, it would cost us $40 a head! Stoked to hear that they are 'back' - even when we were travelling, I havent found anywhere that does crispy 'chicken' or 'squid' like Huo Fo. 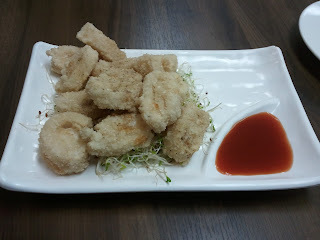 And those fried 'chicken' chunk... takes me back to my popcorn chicken days (before I was vego). Damn, Su Life looks good! What's the public transport access like? Ah, vegetarian restaurants. There are two weaknesses I've seen crop up repeatedly. 1 - great vegetarian food but no idea or interest in feeding vegans well, or 2 - thinking that by virtue of their compassionate veg*n approach they deserve massive kudos regardless of the actual quality of the food or service. When our friend Lisa was editing a veg guide to Melbourne a few years, the owners of one particular restaurant conveyed the opinion that their establishment warranted a full 20/20 rating purely for being vegan. What they were actually serving was irrelevant, apparently. Even though the 20 points was clearly subdivided into food, price, service categories. Just... no. Andrea, that is so true. And I'm regularly shocked by which omnivorous restaurants are great at vegan food - and which aren't. Some of our most high-class and expensive here do an amazing job, and some don't try it all. I've made a point of making the acquaintance of chefs and owners! and do you think the Radish cakes are the same over in America? They're common enough in Veg cuisine here - the place we go on the Gold Coast for Yum Cha/Dim Sum does a pretty awesome radish cake too. Deb - they've taken the prices right back down - around $15 for mains and $5 for entrees. Sadly "fried chicken chunk" is no longer on the menu, nor is "burduck strick". Devastated ;). But the new stuff makes up for it! I'm also surprised - there isn't as much of a delineation between vegan and vegetarian food up here - I guess neither are particularly common, and the Veg Society has a strong emphasis on vegan ;). That Veg Guide was a fantastic guide for me when I went to Melbourne regularly, although it did leave our Trippy Taco. I also have the Aus guide one, but haven't used it as much. It's hard when doing something on such a grand scale, to not be a local. Thanks kiddos! 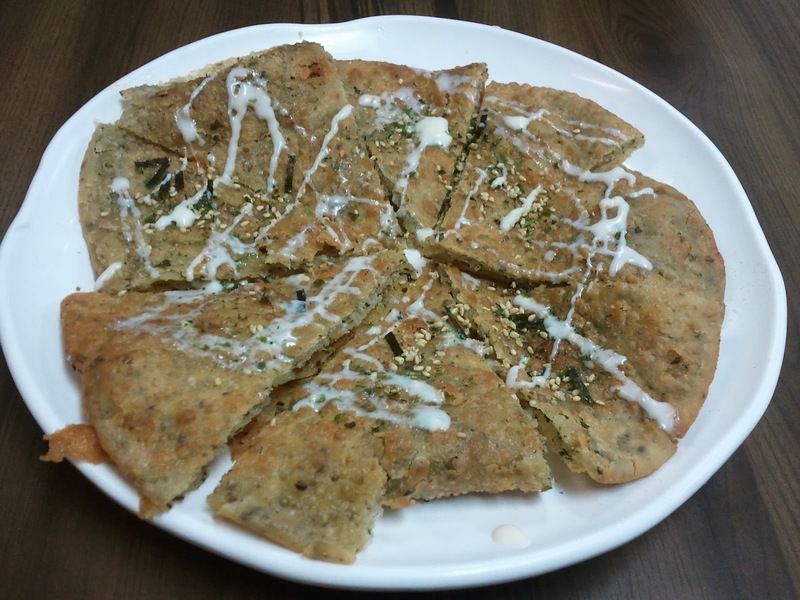 I am itching to go back to Su Life and try some more dishes especially this radish cake thingie... was ist das?? There is a certain apologetic vegetarian style that is full of eggs and dairy - but it is very heavy and hard to stomach - much as I love most old style hippy vegetarian food! I think that it isn't enough these days to just cater to one type of dietary preference - cafes need to be a range of pesky-tarians :-) (with thanks to cindy and michael for the great term). I've only had radish cake at a potluck but would love to find a place that serves it - and then time to go out to dinner! 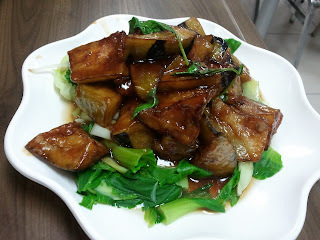 The soups are amazing there and the mushroom hou-tou dish is excellent. Certainly recommend the place! Mum and Dad are both Vego's so we visit the place monthly. I'm stoked to hear these guys have opened a new restaurant. If there was veg. hall of fame for Brisbane they would be the first entrants. I have lots of nostalgia for their place before Huo Fo: "Vagetarian House". Not only did the name entertain me for years, but the location in a grocery carpark off Mains Rd in Sunnybank & the great simple hawker style vego food was totally reminiscent of a Taiwanese back alley eatery. I miss it a lot, but I'm glad they've got a new place to check out. They're lovely people. I always keep an eye for them at Buddha's birthday in Southbank too as they usually have a stall. listen came on this site today and sat down best free online gambling Here I was able to relax and have a good time. We absolutely love getting your comments. Really. Truly. If you have something to say, we'd love to hear it. Just think of the vibrations of excitement you'll give us, and how your good deed for the day will be done. Enter your email address here to receive our new blog posts as soon as we post them!